Today is the unicorn fall day in Minnesota: those days that are so beautiful-crisp air, blue skies, fluffy clouds hovering over crimson, gold, and green-leafed rainbows, verdant lawns and sunlight sure pure, it’s like its been strained through a filter for any lingering debris. But hard to believe they (these kinds of days) are real. The day, however, and a good wine, is something that can all of us feel rich. This is that wine. 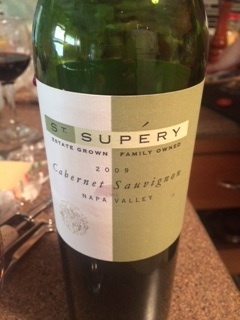 St. Supery, a Cabernet Sauvignon 2009 from Napa Valley is full of pomp and circumstance. Or should I say plump and circumstance? It is big. On the nose, rich cassis that feels like it was liquored in the sun, blackberry and vanilla. It is a potpourri of all the best a Cabernet Sauv can offer. On the palette, it is big–and slightly drowned out by the alcohol at 14.7%, but with a little cheese and some rosemary crackers–it numbed down the alcohol and became much smoother. The length was a good medium length and medium-full on the tannins. The fruit came out and with a little food, was nice and balanced. I recommend no more than half a bottle–especially on a Sunday. But if you can call in sick to work, have at it!